The U.S. has no political will to confront spiraling health costs. Prevention is the only proven way to keep the doctor away. Simply going on walks regularly can significantly improve physical health and reduce risk of developing expensive maladies like heart disease and diabetes. But how does this equal hiking curing the health-cost crisis? I know from my own experience that hiking is a great way to lose weight and stay in shape. But when I hiked off my spare tire, I had hills and trails nearby. 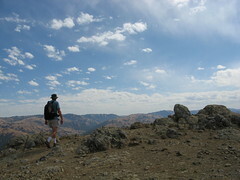 Most people live way too far from a trailhead to hike regularly for fitness. But imagine if the boss orders you to take a hike: You drive an hour to the nearest state park and find out, heck, it ain’t so bad out there in nature with the scenic vistas and singing birds. Only one problem: those hills, roots and rocks are a lot of work. You’re gonna need to be in a lot better shape the next time out. Enter the four-walks-a-week fitness regimen that your boss really wants to you to start, and stick with, because regular exercise is the surest way to stay healthy and out of a doctor’s care. To date our natural reluctance to tell people what they can eat, what they can drink and how many hours a day they can kick back in the hammock have shielded us from shape-up-or-ship-out demands via the glass-office types, but I don’t see how that is sustainable when a huge section of our population is hitting the Golden Years (so named for its capacity to line the pockets of the medical-industrial complex) and our government faces gazillions in unfunded liabilities. After 9/11 we abandoned all pretense of privacy at the airport — it was a crisis after all. And Americans can be reliably counted upon to pull together in a crisis, but only after, as the famous saying goes, all other options have been exhausted. So, I’m thinking that the well-meaning wellness campaigns we’ve endured all these years are about to kick into high gear. Beer guts will be deemed unpatriotic and people will feel obliged swallow their objections to intrusive “do as we say or else” demands because we’re all in this together and all that. Walking during the week and taking a hike on the weekends is a simple, economical way to make Americans healthier and ease the crushing cost of health care. The problem is probably too big to walk our way out of, but hiking seems like a good first step. I agree that most people need to think about health and fitness more seriously, but I can see 3 basic problems with encouraging everyone to hike. 1) There probably aren’t enough maintained trails in the world to support the entire population all hiking for fitness. That would only ruin things for those of us who actually enjoy hiking. I would also support other means of fitness activity such as biking, exercise equipment, sports, dance, organized activity like jazzercise, swimming, etc. But, physical exercise is really is only one part of the total picture. Healthy eating habits are also essential. There’s a lot for people to learn about being healthy, and most seem to just ignore all of it. 2) Americans are very touchy about their personal autonomy. They don’t like anyone dictating terms to them, even if it’s (supposedly) for their own good. People would make a philosophical issue out of it, and refuse. I don’t see how it’s possible to force people to exercise considering our high standard of personal liberty. You can make the effort to encourage, motivate, inspire, educate, etc, but basically, good luck. 3) Our so called “health care” is really just “sick care”. We expect to take a pill for everything, even though most modern medicine only treats symptoms, and have grave side effects. Doctors and drug companies make lots of money prescribing pills for everything. Randy: Good points all… I think that for all our vaunted craving of individual liberties, some kind of enforcement of healthy lifestyles has to be in the cards — the whole system is designed to generate costs which are avoidable only by preventing consumption. What I’m not certain of is whether everybody getting healthy even accomplishes the goal of cutting costs: hospitals have whole wings that are unnecessary because people don’t stay overnight as much as they used to; now they have the fixed cost of all that extra space which must be billed anyway. This idea has merit. We have to do something to get people moving on their feet. Rather than yank health coverage, which may be extreme, we could motivate them in other ways. Employee teams, for example, could engender some peer pressure. I like the overall idea. What is lacking nowadays is proper diet, sleep and exercise. Most people take these three things for granted over money and other things that they want to acquire by working hard. As the old saying goes, “All work and no play makes a person dull”. I think one reason why many people avoid hiking is because we have no skills to navigate or understand the forest. We don’t know about the trees, how to read a compass (or how to use one if we’re lost) or simple things to do if things go wrong. I think many people would love to go hiking, it’s just they are afraid to do it because they know so little about it. You have some good points, most Americans are over weight me included and hiking is a good way to stay in shape. Hiking is one of the things I do to keep my weight down.